I do have a couple of minor editorial observations, though. CN writer David Becker, in his September 10, 2018 response to The Rev. 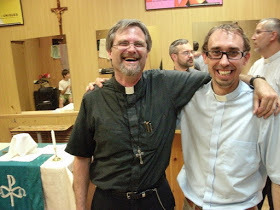 Jason Braaten’s Gottesblog piece “Chasubles, Maniples, and Stoles, Oh My” is unclear. The first headline gives the impression that Pastor Braaten wrote the words below the headline. There is even a byline that reads: “by Rev. Jason Braaten.” Those are, in fact, Mr. Becker’s words, not Pastor Braaten’s. Awkward! 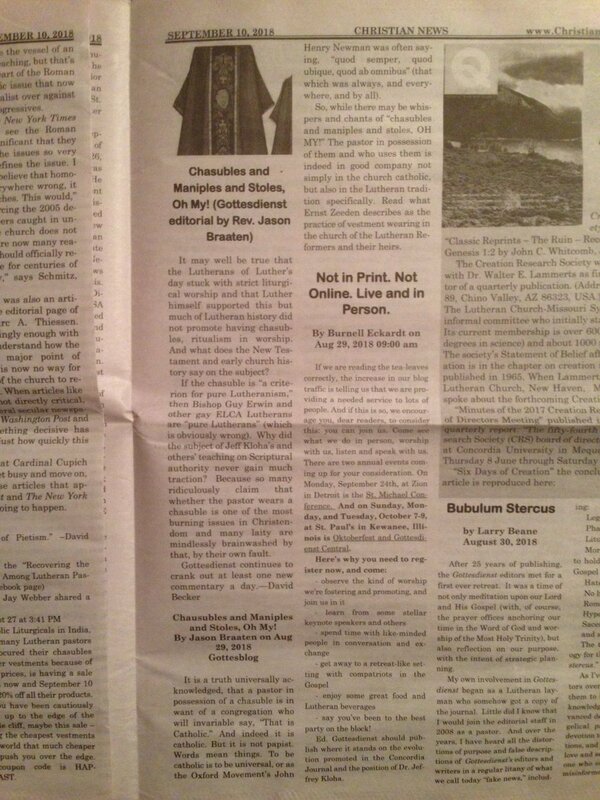 A few column inches down the page, the headline is mysteriously repeated, and then Pastor Braaten’s article is quoted. That’s some crazy editing job, guys! Second, in Becker’s synopsis of Braaten’s article, he seems to have missed the point, and did so in a way that is editorially unclear. The following appears in quotation marks (giving the impression that Braaten said it) concerning chasubles, naming them: “a criterion for pure Lutheranism.” In fact, Braaten is quoting German historian Ernst Zeedon from a book translated and published by CPH in 2012. In this work, Faith and Act, Zeeden describes how the chasuble was historically regarded as the definitively Lutheran vestment over and against the Reformed - whose insistence on abolishing it turned it into a state-of-confession issue in the 18th century. 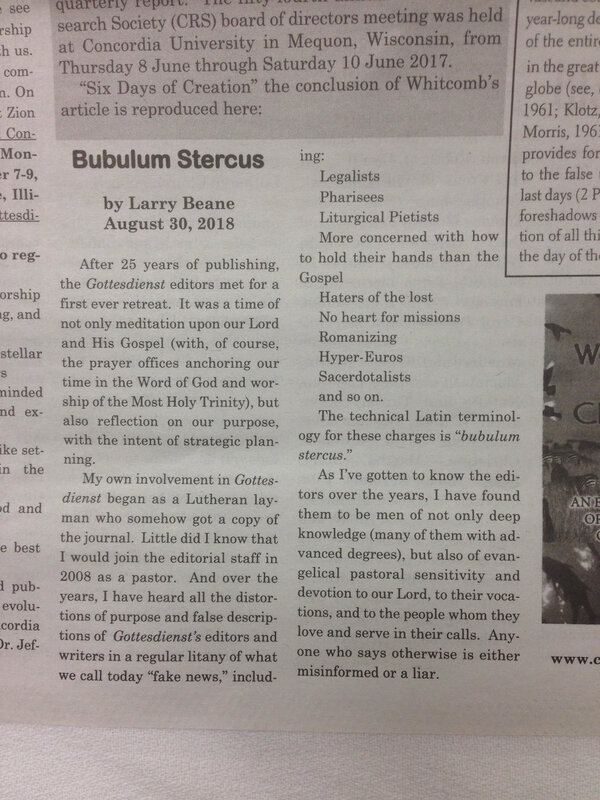 Nobody at Gottesdienst argues that apart from such context, chasubles are necessary or even indicative of “pure Lutheranism.” This mischaracterization of Gottesdienst was the point of my article called “Bubulum Stercus” that CN graciously reprinted along with the Braaten piece, as well as a couple announcements for Gottesdienst events posted by Pastor Eckardt (the September 24th St. Michael’s Conference at Zion - Detroit and the October 7-9 Oktoberfest at St. Paul’s - Kewanee. As we say in the deep South, “Y’all come!”). Moreover Becker says: “Because so many ridiculously claim that whether the pastor wears a chasuble is one of the most burning issues in Christendom and many laity are mindlessly brainwashed by that, by their own fault.” Well, all-righty then! The chasuble is, in fact, an adiaphoron. It is neither commanded, nor forbidden. But being an adiaphoron doesn’t mean anything goes in any context. The fact is that the chasuble upset the 18th century Reformed Christians who denied the Real Presence (and remember, the founders of the LCMS left Germany for America in their refusal to be compelled to worship with the Reformed). It is no coincidence that the “controversial” chasuble is a Eucharistic vestment - because the Eucharist itself is controversial. Clearly, the chasuble, as a Eucharistic confession was offensive to the Calvinists and Crypto-Calvinists then, and perhaps now. Which is a very good reason to wear it. It kind of smokes out those who pay lip service to the Sacrament, while somehow being ashamed that we Lutherans confess what we confess. And another thing about adiaphora, they cease being adiaphora in times of confession. If the powers-that-be were to assert the necessity of chasubles or claim that our salvation rests upon them, we would be saying Mass without them. In fact, there is nothing new under the sun. Mr. Becker’s misstatement about what we at Gottesdienst actually believe, teach, and confess is a common logical fallacy called the “straw man.” Of course, Mr. Becker doesn’t cite anything written by Braaten or Gottesdienst or explain the time period and circumstances that led Zeeden to his conclusion about a crucial part of church history. Nor does he provide evidence for any of the “many” laity who are being “brainwashed” in our own day. Perhaps Mr. Becker is just confused. At any rate, I can come to his rescue. Here is an actual citation from Gottesdeinst Online (now Gottesblog) written by yours truly, as the kids say, “back in the day” (2012): “An Example of Reverent Worship and Why It Matters.” In this article, I include footage that I took of a Mass in one of our sister congregations in Russia’s Siberian Evangelical Lutheran Church the summer before. It was held in a beauty parlor. There were no chasubles, no incense, and no bells. There were posters advertising beauty products on the walls. The altar was a portable table draped with linens. There was no organ. The liturgy and hymns were sung a capella by the small gathering. There were no statues, no stained glass windows, no beautiful architecture that we Americans take for granted. Instead, we were surrounded by barber chairs, hair dryers, bottles of hair-care gels and sprays and pomades. And lots of towels. The pastor, my dear brother in arms under the cross, Father Vladislav, did not chant. And that Divine Liturgy was magnificent! It was beautiful because it was reverent. It was an unforgettable experience for me. Only twenty years prior to this service, the USSR had collapsed and the religious liberties of Lutherans were restored to our dear brothers and sisters in Siberia - so many of whom suffered horrifically, even torture and martyrdom. The beautiful Lutheran church buildings that once dotted the landscape of the largest country by geography in the world (of whose pre-communist population, 10% were Lutheran) are today no more. Many of their buildings were deliberately turned into Communist shrines to humiliate Russian Christians. But the faith prevails to this day among the Russian people, many of whom, like the members of Holy Spirit Lutheran Church in Chelyabinsk, worship in rented spaces - and do so in many cases with more reverence than their wealthy American counterparts. If you want to read their stories in their own words, click here! You can watch the footage that I shot here. So I do hope that David Becker, whom I now feel confident in nominating for president of the Gottesdienst Fan Club, is squared away on what we believe, teach, and confess about chasubles and other vestments. In fact, we would like to ask our friends and fans at Christian News, have you seen the video? We know y’all would really dig it. We hope you will help us get the word out about it. Keep up the good work promoting Gottesdienst!